This review article provides information about diabetes mellitus and its subforms, presents current scientific knowledge regarding its effects on forms of dental treatment and makes recommendations for routine practice. The World Health Organization and the International Dental Federation have recommended the use of the Atraumatic Restorative Treatment (ART) approach in the developed and the developing countries. It is a logical technique based upon sound and scientifically-based principles. It is a restorative and preventive procedure, largely pain-free, maximally preventive, and minimally invasive. It depends on removing the demineralized tooth tissues using hand instruments only and restoring cavities with glass-ionomer cement. More than 275 scientific papers have been published on ART in the last thirty years. 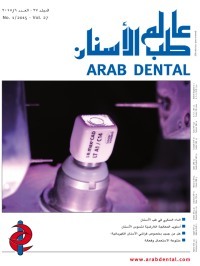 The results of the clinical and field trials that carried out in developing and developed countries have indicated that high-viscosity glass ionomer cement can safely be used to restore single- surface cavities both in primary and in permanent posterior teeth. Also, the high effectiveness of ART sealants using highviscosity glass ionomer in carious lesion development prevention is not different from that of resin fissure sealants. More studies are needed to evaluate the application of ART in multi-surfaces cavities. The wide range of glazing techniques available provide something for everyone. The significant issue is that, thanks to their ease of application and transparency, VITA AKZENT Plus shades integrate with the porcelain ideally. As they do not interrupt light interaction within the veneer, they breach the paradigm we still have while staining our restorations. Crowns fabricated using the simplest of techniques can be transformed into vital, customised restorations brimming over with dynamics by applying AKZENT Plus. Along with fear, the sometimes uncooperative behaviour of children and teenagers presents a particular challenge during dental treatment. However, "dental phobia" is considered to be very widespread in adults too. Today's modern dentistry offers several options for treatment that is free from fear and involves little pain. One of these is minimal sedation with nitrous oxide, which ensures a relaxed visit to the dentist safely and gently.